DUG Insight User ManualFrequently Asked QuestionsFrequently Asked Questions HorizonsHow do I perform an amplitude extraction at different angles through the volumes? This can be done by performing amplitude extractions on horizons that dip at specific angles. From the View menu in the Control Panel, open the Map View. Select an existing horizon that covers the area (the waterbottom might be a good choice). 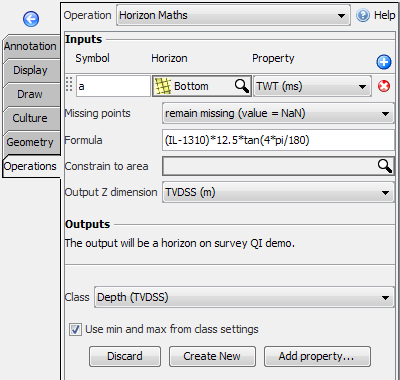 Expand the Operations tab and select Horizon Maths. 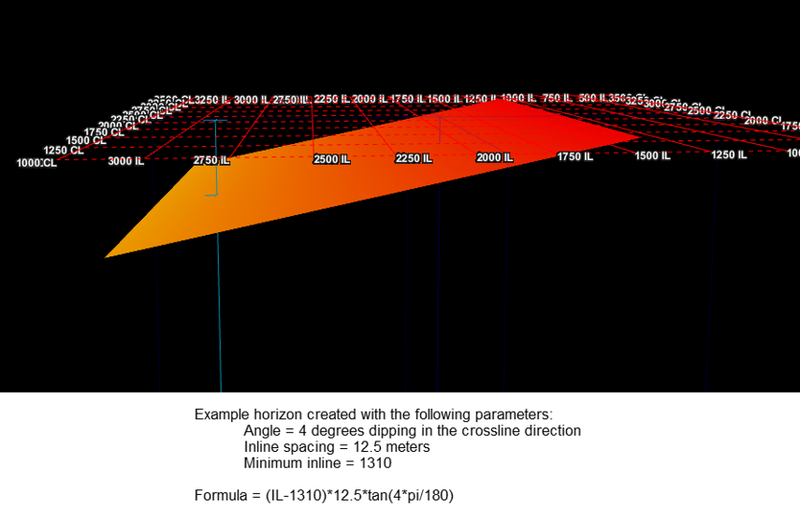 This formula calculates a new horizon with depth values at a specific angle dipping in the crossline direction. You can replace the IL with CL to set the dip direction to the inline direction. Define the output as TVDSS (m) since the survey spacing is measured in meters. Click Run to begin the operation. Once you have this base angle horizon, you can use the Ghost operation in Map View to move the horizon up or down by a constant amount (see Ghost). This will allow you to cut the volumes at different depths/times. If you need to convert the horizon to time so you can extract amplitudes from time volumes, a constant velocity volume that will allow a 1:1 conversion between the TWT and TVDSS for the horizon can easily be created. Select Volume Maths and give the process an appropriate name. Set the Formula to a constant 2000. This will create a new volume under the Volume tab. Change the class of the volume to Average Velocity. 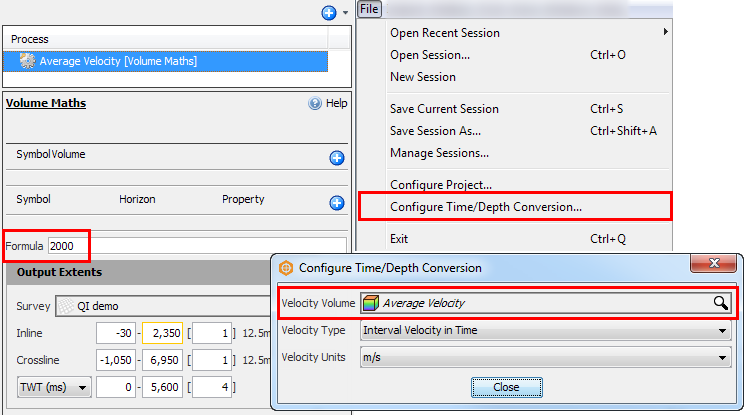 From the File menu in the Control Panel, select Configure Time/Depth Conversion. Choose the new volume as the Velocity Volume. Now you have dipping horizons on which you can view amplitudes/values from your volumes. Remember you can just change the horizon property to Amplitude in the Map View to do the on-the-fly amplitude extraction. Prev: How do I create a contact horizon for use in layered models? Next: Why is the amplitude value as shown by the cursor different than the horizon extracted value?